While I don’t shy away from de-veining a foie gras or beating the heavy dough of the yearly Stollen for 10 solid minutes, the idea of forming sticky wet dough into dozens of tiny elaborately shaped cookies never particularly appealed to me. I used to find cookies too fiddly. But time passes, I change, and how else to have lots of homemade cookies at Christmas time? So last year I embraced cookies, and I must admit I’m enjoying making them — a lot. There is a strong Christmas cookie making tradition in Germany, where my grandmother came from, and Switzerland, where my grandparents lived and where we spent every Christmas until I was 9. So the cookies I crave at Christmas are Lebkuchen and Zimtsterne, Linzer and Chräbeli. Makes about 40 cookies. Translated and very slightly adapted from La Mia Cucina, with thanks to Jennifer for pointing me in its direction. With a whisk, beat the eggs and powdered sugar for a good 10 minutes. Optionally, heat a small pan, remove from heat, and add the anis seeds just to warm them up. Combine the anis seeds, Kirsch, and lemon zest with the egg/sugar mixture. Prepare a cookie sheet with buttered parchment paper. Divide the still slightly sticky dough into 2 parts, and form into a thick roll; divide each of these into 4 pieces, and roll each piece into an even, long stick about 1/2 inch (1 cm) in diameter. Form each of the four sticks into 4 cookies and place them onto the buttered parchment paper. 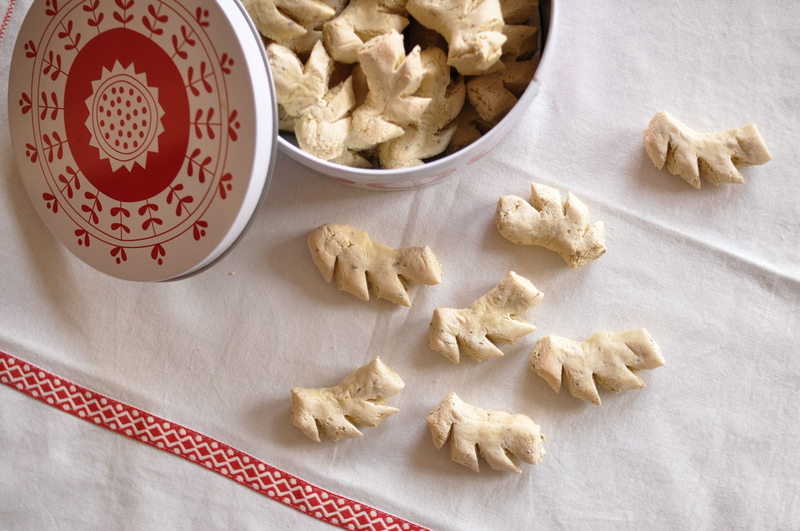 To form the cookies: cut the stick into 4 pieces 1 3/4 in (4 cm) long, then with a clean, sharp knife, cut 3 angled incisions halfway into the cookie to form the ‘branches’ (or ‘feet’), then bend into a half-moon shape. Let the cookies rest for 10 hours in a cool place with an even temperature and no draft. When ready to bake, preheat the oven to 325°F (160°C). Store the cookies in a tin in a cool place for up to a few weeks.